The National Diet Library recently put Nunome Eiichi's essay, The Popularization of Rōkyoku through Records, online. From the latter half of the Meiji era (1868-1912) to the middle of the Showa era (1926-1989), for little over a 50 year period, rōkyoku (naniwabushi) were enjoyed enthusiastically in every corner of Japan, and were hailed as "the king of public entertainment". Records played a key role in their popularization. Since about 1900, visitors to the precincts of Sensou-ji Temple could listen to sounds from phonographs in the phonograph shop. This phonograph was called the "Ediphone", and had a number of rubber tubes directly connected to the device. The end of each tube forked, forming something akin to a stethoscope one would place over both ears and use to listen. During the 40’s of the Meiji era (1907-1912), when rōkyoku passed its golden age, popular stars had their names painted in rubric on sheets and sheets of paper that would flutter in the wind. "The very first disc recording in Japan was made in 1903 in the Hotel Metropole at Tsukiji," Nunome notes. I had not heard that! Some of the examples can only be played within the NDL (or a partner organization), but quite a few can be played by anyone anywhere. Here's a photo I took at a nearby supermarket showing an example of cultural change (I hesitate to say evolution) fossilized in the lexicon. 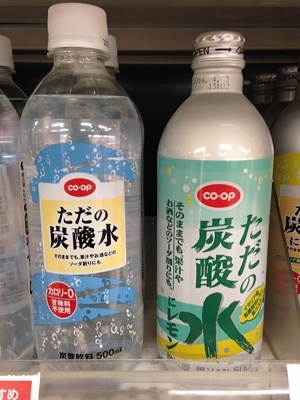 On the left, ただの炭酸水, tada no tansansui: "Just carbonated water." This is a product name which uses humorous plain-spokenness to make its sales pitch: this isn't fancy imported spring water, or mineral water, or anything like that. It's not flavored. It's just carbonated water, period. On the right, we see that the line has expanded: now we have ただの炭酸水にレモン, tada no tansansui ni remon, "Just carbonated water, with lemon." The success of tada no tansansui made this sort of step inevitable, I suppose, but it's difficult to see it as anything but jumping the shark. The whole point of tada no tansansui is that you can just grab a bottle off the shelf and not worry that it might not be what you want: it's just carbonated water, that's all you need to know. Now, though, it also comes in lemon flavor. (Lime, too, and something else I forget.) You know — just in case you didn't want just carbonated water from your bottle of "just carbonated water." I fully expect to see tada no tansansui-brand cola on the shelves within a year or two. I've noticed advertising around Yokohama recently featuring the slogan "I ⭐️ YOKOHAMA." Context made it clear that the goal was to encourage women to support the Yokohama BayStars baseball team, but how to read that catchprase? "I star Yokohama"? Each and every person who loves Yokohama shines like a star in the night sky as they join together to make an even more enchanting Yokohama: [the logo] expresses these feelings not with the LOVE of a heart but rather with a ⭐️. This may seem arbitrary at first and, well, it is. But it's completely in line with the norms of the Japanese writing system, where any given Chinese character — or indeed any character at all — can be assigned any pronunciation at all, just by writing it down in slightly smaller characters off to one side. If 一致 can be "harmony", ⭐️ can certainly be "love." Hey! I wrote another review for the Japan Times , this one of Dazai Osamu's Return to Tsugaru . Ōkyo's "Skeleton" may have been the first anatomically accurate skeleton depicted in a lotus position, but skeletons had a long and bifurcated history in Japanese iconology. Ōkyo's innovative depiction rested on shasei, the realism he adopted from rangaku, Western studies [...]. Until the first officially authorised dissection of a human corpse, performed in Kyoto in 1754 by the physician Yamawaki Tōyō, published as the Zoshi [sic! should be Zōshi 蔵志] Anatomical Record in 1759, knowledge of human anatomy had rested exclusively on Chinese medical treatises. [...] The visual dissonance between the naturalistic skeleton and the traditional, Song inspired waves would have shocked the non-metropolitan viewer, who might not have easy access to Sugita Denpaku's Kaitai Shinsho [another rangaku anatomical work]. Ōkyo effectively uses the latest scientific findings to represent what is left once all that is transient, from human passions to the various processes of aging, disease and decay, have been stripped away. Dropping off body and mind is zazen. Given that visibility of the subject is a basic requirement of portraiture, you couldn't drop off much more body than Ōkyo's skeleton has. Just like that, I'm going back after all?—After all the hassle I went to on that non-short road to come here? A naive hypothesis would be that makaru means "go" while mawiru means "come". The truth is a bit more complex: makaru means "move from a place of high status to a place of low status" and mawiru means the reverse. Here Yakamochi is using it as a politeness strategy, exalting the residence of the poem's intended recipient by comparison with the lowly hovel he has implicitly come from. In the case of mawiru this usage survives into the present day — mairu is in the standard keigo library as a humble way to express the act of moving to your interlocutor's current location. I don't believe makaru has retained any significant role, though. My review of Morse's Japanese Homes and Their Surroundings is up at the Japan Times! This is a book I read and reread obsessively while meeting with our architect. Also, bonus fact that got cut from the review for lack of space: Morse was the one who introduced Ernest Fenollosa to Umewaka Minoru, one of the "Three Masters" of Meiji Noh (明治三名人). I'm not going to say "No Morse, no Noh, or Accomplishment ," partly because that form of the assertion is only barely parseable, but it's a giants-on-the-earth-in-those-times story if ever there was one.